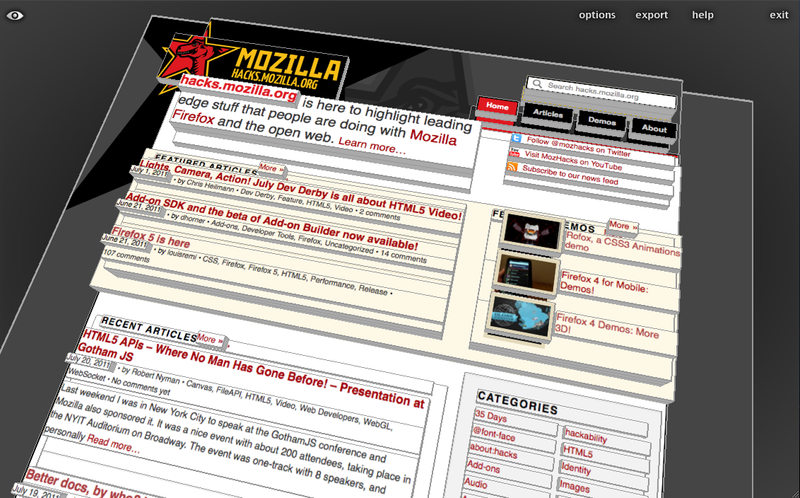 Tilt is a Firefox extension that lets you visualize any web page DOM tree in 3D. It is being developed by Victor Porof (3D developer responsible with the Firefox extension itself), along with Cedric Vivier (creating a WebGL optimized equivalent to the privileged canvas.drawWindow, see #653656) and Rob Campbell (who first thought about creating a 3D visualization of a webpage). Everything started initially as a Google Summer of Code project, but now, with an enthusiastic team behind it and so many new features and ideas, it has become an active Developer Tools project. Tilt is a fun new Firefox extension focused on creating a 3D visualization of a webpage. Since the DOM is essentially a tree-like representation of a document, this tool layers each node based on the nesting in the tree, creating stacks of elements, each having a corresponding depth and being textured according to the webpage rendering itself. Unlike other developer tools or inspectors, Tilt allows for instant analysis of the relationship between various parts of a webpage in a graphical way, but also making it easy for someone to see obscured or out-of-page elements. Moreover, besides the 3D stacks, various information is available on request, regarding each node’s type, id, class, or other attributes if available, providing a way to inspect (and edit) the inner HTML and other properties. The visualization is drawn using WebGL, for dynamic, fast, in-browser rendering. At initialization, Tilt creates individual 3D objects (structures describing how the webpage geometry looks like) using the DOM, with the BODY as the lowest layer and the base of the document upon which descendant nodes are layered. For each successive level, another platform is built, adding depth to the 3D webpage mesh. For example, stacks are built from DIVs, ULs, or any containing node with children. Controlling the visualization is achieved using a virtual trackball (arcball), which rotates around the X and Y axes. Other mouse events exist to control yaw, pitch, roll, pan, zoom, as well as various additional keyboard shortcuts. The controller is not tied to these peripherals only however, making it accessible and easily scalable for other input methods or devices. Double clicking a node brings up the Ace Cloud9 IDE editor, showing more useful information about the node and the inner HTML. You can find the Tilt source code and the latest extension builds on Github, and a development blog with milestone updates on blog.mozilla.com/tilt. For now, to test the extension, just download the latest stable build (tilt.xpi: download the file, then open it with Firefox or drag’n drop it on Firefox), install it and search for Tilt inside the Tools menu. Or, you can use Ctrl+Shift+L (or Cmd+Shift+L if you’re on a Mac) to start the visualization. Close it at any time with the Esc key. Tilt works with any webpage, so you can even inspect this blog to see how it looks in 3D. More features are soon to be added, some of which include: modifying and updating the 3D webpage mesh on the fly (as the webpage changes, exposing CSS transforms for each node, plus customizing stack spacing, thickness, transparency etc. ), rendering elements with absolute position or floats differently (e.g., hovering above the webpage based on their z-index), creating a more developer-friendly environment and better integration with the Ace editor and the Firefox Developer Tools. (highlighting the currently selected node, instant 3D preview), exporting the visualization to other browsers or applications (as a 3D object file, probably .obj and/or COLLADA). The greatest milestone will be achieving seamless 3D navigation between webpages, as in a normal 2D environment. For more information about upcoming tasks visit the TODO.md list. To install the XPI, download the file, then open it with Firefox or drag’n drop it on Firefox. It’s working through the menu, although Ctrl Shift L is bringing up Firebug. It would be nice to be able to customize the keyboard shortcut. Anyhow, great job, it looks great and very useful. I have FF 3.6.18 installed. When I drag-n-drop the XPI onto FF it tells me it is not compatible with that version of FF. I have 3.5.6 and it isn’t compatible with that version either. Wow! This is awesome. Love watching websites in 3D. :) ..
BTW, will it work on all the builds of Firefox? Very cool stuff! Keep up the great work. suxx — it go crashie on 2nd page I tried it on. This is actually really valuable as a developer to see how my page structure looks & make sure it’s clean! This makes a lot of sense dude., Very good stuff. Wow. Wow. This is really amazing. It would be awesome if this gets extended to include more details (like Firebug) and the ability to zoom “into” nodes to get to subnodes — so zooming in/out doesn’t mean having the whole thing get closer/farther, it means peeling back layers. Ctrl+Shift+L opens the Panorama to me. Can you write an export tool so I can import the 3d webpage into minecraft? Is there a version of the video for modern browsers? I would really like to see the <video< tag useful somewhere else than on the realease notes page of firefox and also, sometimes, be able to watch videos. I cannot force anyone on the net to provide content through the video tag, but I expected mozilla.org to be the very first to make this effort. Keep on with the good work, from the comments above Tilt seems to be really impressive! If you can’t get it to work, check about:support to see if you have webgl available. A lot of people find that their graphics driver is blacklisted, because it was causing crashes. If that’s the case, simply updating it is all you need to do. Wow this is great! Reminds me of flipping to 3D in Paper Mario. OK, so where is the Tools menu?? Press the ALT key. Also mine has the short-cut CTRL+SHIFT+M. Most Linux desktops have had a similar feature for about 6 years…. Glad to see this featured here! He’s been working hard on it and it’s something that stands out of the crowd. Good job! And HTML? will bring us 3D specifications – then webdesigners are able to build 3D Tables ??? To enable it with firebug, Customize firebug shortcut from ctrl+shift+l to something else. Neat. but how useful is it? @morgan: And how exactly does a “3d desktop” compare to a 3d visualization of a DOM tree? Other than that they’re both 3rd they have nothing in common. Let alone the fact that this is about a browserextension/plugin and not a desktop fancyfier. Wow! Now it will be much more easy to explain my job to my kids… “Look I’m building a page just like you do with your LEGO”. You should have named this extension “LEGO DOM”. It’s a very interesting way to look at pages. Suggestion for new feature: it’d be cool to be able to reverse the direction of the interpretation, so that higher priority objects and copy are highest. To generate a “SEO” view of your page for instance = which objects are seen first. Nice job, will watch out for the next versions! Lol, i’m running an i7 machine with 1gb of dedicated memory.. Drivers up to date. can any one help out? Doesnt work. FF 4 / Win7 x64. After I first installed the extension (by dragging the link onto the addons pane), it did nothing and was visible but inaccessible in the addons pane. It didn’t ask to restart Firefox, but after restarting Firefox it worked. The shortcut seems to be Ctrl-Shift-M now. The “help” or “exit” links do nothing for me. Doubleclick works sometimes, but often it has the side effect of rotating the page, or the DOM for the wrong element is shown. Why is it doubleclick anyway if single left click isn’t taken? I would love it if I could just click on an element and have it highlighted in Firebug. So cool to see this tool alive, in the field. I have had exactly the same idea in my head and actually did my Msc thesis on the subject. I didn’t have the time to develop my idea any further out of the conceptual stage I left it at in December, 2010. So, I am really excited to see that somebody actually did do it! It offers so many possibilities to web developers, I’ll be following this project with great interest! For anyone having trouble with webGL just go to about:config and look for webgl, and turn it to true. Thanks a million for such a great extension. I had a lot of trouble getting it to work in Firefox 5. If you’re getting the error message “Could not initialize the WebGL context, your hardware or drivers may not support it.”, try the following. 1. In Firefox’s URL bar, type “about:config” and press Enter. 2. Click the “I’ll be careful, I promise!” button. 3. Do a search for “webgl” in the Filter field. 4. Check that “webgl.disabled” is set to False. 5. Double-click “webgl.force-enabled” to set it to True. Now try running the addon again. Hope this helps some people, as Tilt is a brilliant tool! On a Mac (Snow Leopard) and FX 5.0.1 all I get is a black window. My machine is not that old (early 2008 Mac Pro). I’ve always wanted this to debug z-index issues. I use a bookmarklet now to help with this. See http://www.erichynds.com/jquery/visualizing-your-z-index-stacks-with-jquery/#bookmarklet for the bookmarklet that can be used in any browser. Is this only for FF 4.n? Is there any way I can try it on FF 3.6? “webgl.disabled” is set to False. “webgl.force-enabled” to set it to True. Nice and usefull. Can you make it work in other webgl enabled webbrowsers? that is really a nice extension. I will definitely try. It is marvelous. Now I can debug in 3D ! Warm thanks to the devs and good luck. Would be great if this could be made available on the Web Developer Toolbar. WooHooo Works like a charm! Thanks you guys! Great tool! This helped me solve a problem, in an inherited web project, in about six minutes that I’ve been working on for three days. Awesome tool! Yes, totally! I so want the Google Chrome version of this addon! Please notify when it comes out!! Such a unique 3D functionality in Firefox! Can someone confirm that ‘s working on firefox 7 on mac ? Awesome, this is extremely cool. This is coolest developer visualization tool I have ever seen on web! It works just fine in Firefox 8.0…BTW I do not understand why ppl are still running versions 4 or 5 or however old releases of Firefox – is there any reasonable explanation not to upgrade your browser to the latest release? Unfortunately CTRL+SHIFT+L is the same shortcut as firebug another essential tool for developers. Integrate it into Firebug (Similar to YSlow) or pick a new shortcut key combination. I can see a potential here of making real 3D webpages viewable on the iPhone using a “Hasbro My3D”! My hardware and the browser are all right. The problem seems to be some incompatibility between webGL and my Intel HD Integrated. I’ve tried all possibilities but I am still under the weather, does someone has any clue? I really wanna use this add because I am learning html and it’s very usefull to see how the tags works. This is great but what happens when people start setting z-index:999999?